Description: Castle with chateau interiors. Residence of the last-but-one heir to the Austro-Hungarian throne - Franz Ferdinand d'Este. He was assassinated in 1914. This event started the First World War. Museums, weapons and hunting trophies, bird sanctuary, gardens, park, greenhouses, forest. Themes: History (Middle Ages and late 19th - early 20th century), architecture, romance, nature, animals, roses, souvenirs from Asia, Africa and the Americas, hunting, diplomacy, Catholicism, early 20th century technology. Transport, difficulty: There are about two trains an hour from Praha hlavní nádraží and one coach an hour from Praha ÚAN Florenc. The local coach station and railway station are in the nearby town of Benešov, about 2,5 km from the castle. The walk / bike ride is mostly through a park-like forest with minimum elevation. For cars: the parking lot is just a couple of hundred metres from the castle. On the spot: There is a small electric train (20 CZK / ticket) that criss-crosses the grounds and also goes to the town and the railway station, but it only goes about 5 times per day. Suitability for children: 60%. Small children might get bored during the one-hour lecture by the guide inside the castle, but on the other hand, the interior is more interesting to children than most other Czech castles and chateaus's interiors. The castle grounds are more suitable for adults (park, statues, rose garden, museums, greenhouses), but as it is possible to find something behind every corner and there're also fountains, a live bear and peacocks, there's not much danger of the children getting desperate for an ice-cream every 20 minutes. Facilities: Very good. This is a castle I admire for its taste in facilities. There are park benches, maps and orientation signs everywhere and all shops are situated in the castle's yard. Toilets, two small, but sufficient souvenir shops, two small cafés and a very nice (and inexpensive) restaurant. All of this made to fit the historical athmosphere. The only problem is the size of the ticket office - it's too small for a relatively famous place. If you're going here on a warm summer Saturday or Sunday, be prepared to spend about 10 minutes waiting to buy the tickets. (Perhaps this seems like a short time after all, but in most Czech chateaus and castles, you don't have to wait at all.) And send just one person to buy the tickets if you don't want the rest of the group to get lost in a 6-people-crowd. Language: No problem communicating in English, if you keep it simple. The restaurant's menu is translated to several languages. The castle interior can be toured with a German, English, French or Russian-speaking guide. But as I haven't discovered any system in the times when the foreign language tours start, it's better to book one ahead. Or to go on a Czech tour and borrow an audio guide with earphones for 50 CZK. Pronunciation, meaning: Benešov is pronounced "Benneshof" and probably denoted a place that belonged to a guy called Beneš - which is an old diminutive form of Benedikt. Konopiště is pronounced "Konnopishtyeh". IMHO it used to mean "hemp field" or "place where hemp is processed" (note the similarity to the word "cannabis" :-) ) Jamaica flag owners, don't expect anything exciting here - historically, hemp was used to make ropes and ointments. Although I did meet a guy that was totally high on the way back - but that was in a DVD shop in Prague. I'm starting this story with "So, we went by train to..." as promised! So, me, my Latvian friend and my Estonian friend got on a train in Praha hlavní nádraží and started the journey by getting... delayed. Yeah, there was a powerful electric storm yesterday and lots of railway thingamajigs got damaged, so our train had to wait for another train that was waiting for another train. That just lasted 15 minutes, though, and we weren't in a hurry, so we kept chatting happily in our four languages. The journey by train was enjoyable especially for me because I realized that there actually are beautiful sceneries in my region - Central Bohemia. I live in a flat countryside east of Prague that basically consists of fields, poplar alleys and more fields, but once you travel south of Prague, you see hills, streams and thick forests. I'd happily forgotten that because the demon called All-Places-in-the-World-Are-Interesting-Except-Mine had gotten at me. And yet, these are the parts where Czech summer holidays are spent, the parts that continue with the picturesque Southern Bohemia rolling hills and the parts where Josef Lada, painter and children's books author, lived 100 years ago! 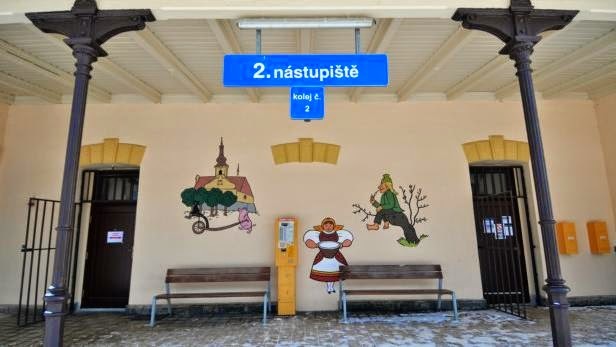 One of the towns we passed actually used some characters from his books in decoration of the railway station. We got off in Benešov u Prahy (literally "Benešov at Prague"). If you, too, go by train or coach, your best bet is to follow a colour line of the Czech Tourists Club. You can find the yellow one if you step outside the railway station (or the coach station, which is right next to it) and stand with your back turned against the railway tracks. Then it's on your left hand side, just a couple of metres from the railway station. It goes together with the sign "Konopiště (zám.) 2 km." This is a mark you find every 200 metres, more or less. It takes keen eyes and sometimes a bit of looking for, but it's reliable. 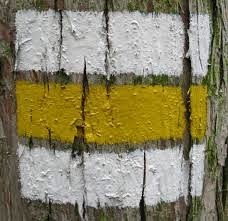 Here, it's mostly painted on lamp posts and road sign posts, and it goes together with the red mark. When they separate, you're supposed to follow the red one. It goes through a lovely suburb with villas and gardens. Don't worry when it leads you into a suspicious-looking alley that ends with a wall - it wasn't put there by white meat hunters. It actually leads to a narrow gap in the wall that ends with a zebra crossing across a busy road, then a stone gate and a forest path that will take you straight to the castle. 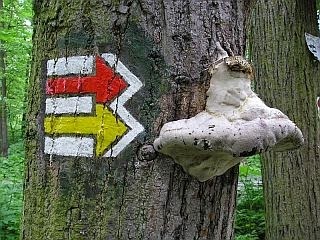 When walking in the forest, you'll see a house painted white, with deer antlers on the wall, on your left-hand side. Whenever you see deer antlers on a house in the CzR, you can be sure that it used to be (and probably still is) a forest-keeper's house, who was put there by local aristocracy to take care of the woods. 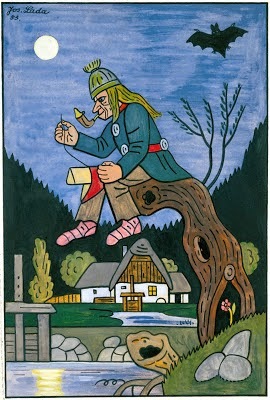 In Czech, such a guy was called hajný and his house hájovna. You are free to confuse it with the words myslivec and myslivna, especially because Czechs confuse them, too, and myslivnas look just like hájovnas. There is one myslivna near the castle, too, only it's brown. I personally think that hajný took care of the forest in general, especially the trees, and myslivec was more of a game-keeper - he took care of the wild animals. Today, myslivec is basically any guy with a hunting license. And the word is a source of much fun to kids because it's derived (or sounds as if it's derived) from the word myslet - "to think". So, in Czech, a hunter could actually be a philosopher! If you think this is a useless lecture, the most famous owner of the castle, Franz Ferdinand d'Este, wouldn't agree with you! His myslivec took such good care of the wild animals in the forest attached to the castle, that they bred like crazy and hunting actually became a necessity. But Franz Ferdinand also hunted down three elephants in India and made himself a elephant leg umbrella stand. I think that's also why he chose statues of a hunter and the Antic goddess of hunting to decorate the gardens. Actually, hunting seemed to us like a topic that sticks to you and won't come off from the very beginning. You see, it wasn't our plan at first to go to Konopiště. We'd planned to go to a Northern Bohemian chateau called Ploskovice. But two days before, I found an announcement on its web page: "The chateau will be closed due to film shooting." I told this to my Estonian friend and we opened the Konopiště web page. When she saw the bear next to the web page name, she asked: "If there's film shooting going on in Ploskovice, is that why there's bear shooting going on in Konopiště?" No, there was no bear shooting. Although Franz Ferdinand had shot several and had them stuffed, and if you're getting married at Konopiště, you can take a picture of yourself that will make your friends think you married a bear. Plus, there's a live bear kept in the castle moat for the general enjoyment and photographment of the public. This bear is Asian. I remember when my class went here on a school trip in 1990 or 1991 and the castle looked different from what you see now - after the 40 years of Communist rule, it had all four D's: dilapidated, deserted, dark brown-grey and depressing - the bear was a European brown bear. 1) its shape and its towers. If you know French castles it will seem like a perfectly ordinary castle - that's because it was built with French castles in mind. Apparently, the high number of tall round towers made it easier to defend the castle. There is no other castle like this in the CzR. 2) There's no tall rock or a village nearby. Having visited some other Czech castles, you'll know that a castle is usually either situated on top of a tall rock, or it has a village or a town around. This one has neither. There had been a village called - guess what - Konopiště, but when Franz Ferdinand learned that he's going to become the Austro-Hungarian emperor, he made the castle into a luxurious representative residence, destroyed the village and had the villagers move to Benešov. The smell of the village brewery, pig-sties and stables was apparently unfit to be smelt in an emperor's salon. Are you wondering why make a Czech castle that's hidden in a forest the main residence of the Austrian emperor? Well, that's how thoughtful Franz Ferdinand was. He'd bought this castle when he was very young, and started to reconstruct it. But then he met Žofie Chotková (Sophie Chotek in German), a daughter of a Czech squire, and fell in love with her. She didn't have much property or social standing and that's why it took several years to persuade Franz Ferdinand's uncle, the emperor, to allow them to get married. Still, there was much hidden opposition to this marriage in Vienna's aristocratic circles. And that's why Franz Ferdinand decided to move to Konopiště where they could live quietly, far from Vienna's gossips. They had a very happy marriage, three children and... they died together. An assassin killed them in 1914 in Bosnya's Sarayevo, far from their home. That was meant as a protest against Austria-Hungary claiming Bosnya for themselves in 1908. Funny thing is (or, rather, tragicomic), that Franz Ferdinand was actually the one royal family member who was very much against claiming Bosnya and faced many problems in diplomatic circles because of his views. 3) This is the only castle in the CzR that used to have a sea ship on a pond! I'm not sure whether this is its anchor or the place where they tied it to the ring with a rope. One of Franz Ferdinand's sons was interested in navigation and wanted to become a naval officer. And because the Czech country doesn't have a sea, but Austria did, Franz Ferdinand took one of the Austrian sea ships and put it on the small lake near the castle, so his son might practise. This made for an interesting end of the trip for us because neither my Latvian nor my Estonian friend are used to lakes that can be emptied just by lifting a dam. Their countries have heaps of beautiful natural lakes.